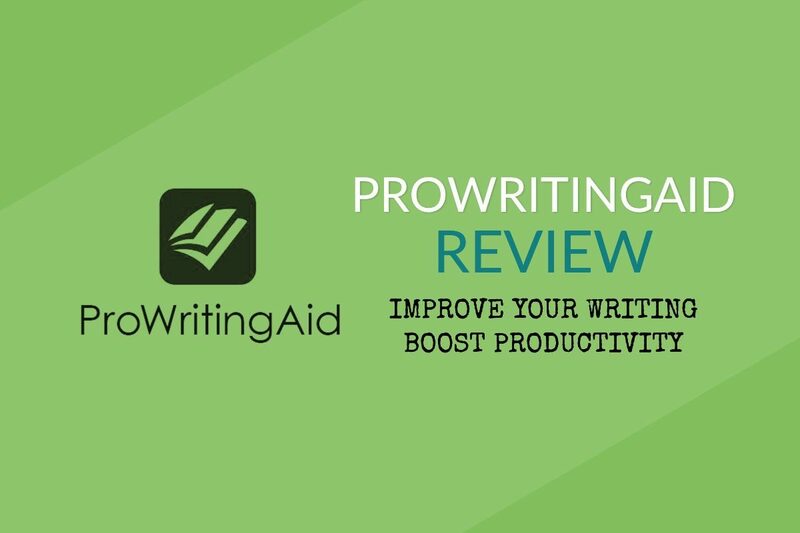 ProWritingAid (Pro Writing Aid) appeared up on my radar a few years ago and I grabbed a lifetime deal. I won’t keep you in suspense: It’s been a great investment. This proofreading software for writers will help you expertly edit your work online. It also improves the flow, vocabulary, and grammar of your writing as you create. Real time grammar checking, spelling checks, thesaurus suggestions, and “style guide” tools help make your writing clearer and less boring. ProWritingAid is a powerful tool. To get the most from it, you need to know how to interpret certain features. In this review, I’ve broken down the editing features into easy to digest tips for getting started and using the software to its potential. Get ProWritingAid and follow along! Nothing in life is 100% free. And the same goes for software. ProWritingAid has free and paid plans. 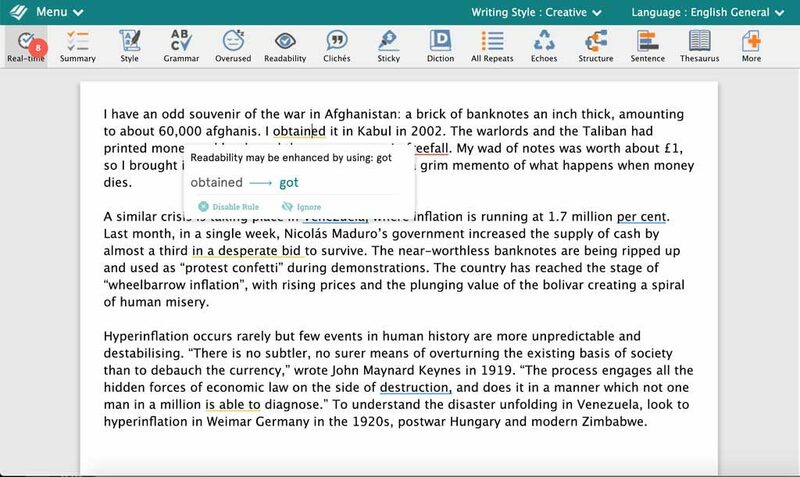 The free plans are generous, offering full access to the software’s editing features for up to 500 words. You could write a book on this. But let's keep it short and focused on the review. 1. 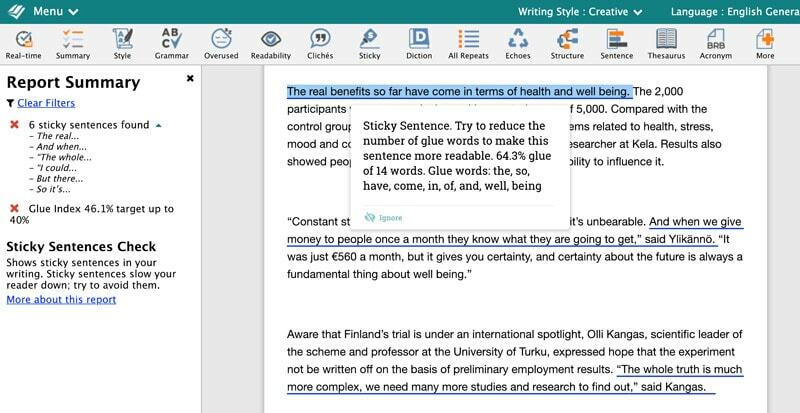 Works like a personal online writing editor. ProWritingAid corrects your grammar and spelling while improving the structure, style, and readability of your content. You might ask why anyone needs a grammar and spelling checker when Word, Google Docs, and other writing packages have built-in tools. The answer is simple. ProWritingAid focuses on improving your writing. The other apps are, well, writing apps. They provide an interface for content production. ProWritingAid’s bread and butter is helping you produce the best content. 2. Lets you easily correct the grammar and improve the readability of your work. Maximise your writing’s impact while minimising the time spent editing. Improve text by taking actions with the best return on investment. 3. Improves your vocabulary and writing style. As you write, the app follows along and makes suggestions for improving readability, style, and spelling. The Real-Time report tab at the top left of the screen indicates the number of issues found. Hover over words or phrases and click the green-coloured suggestion to accept the suggestions. It’s a beautiful workflow that gets fast results. Choose Word Explorer from the Menu or hit CTRL+SHIFT+E on Mac to open a suite of tools the will help you choose the perfect words for the job. Forget about wasting time opening dictionary.com or thesaurus websites. Use this tool to find synonyms quickly. 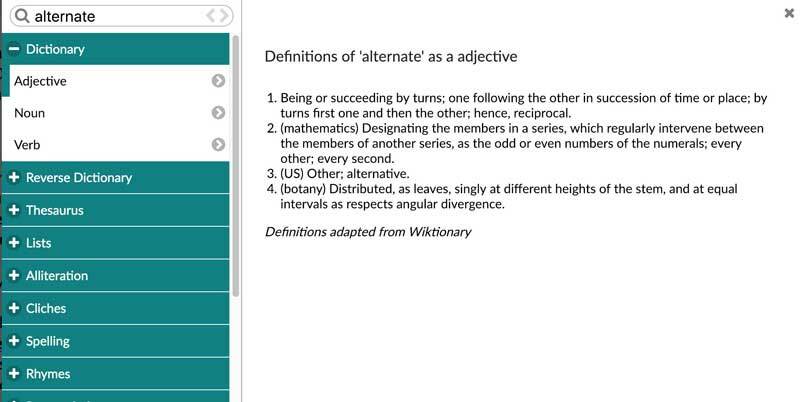 The Reverse Dictionary is great for finding words that have your target keyword in the definition. It’s sort of like reverse engineering a phrase. For creative writers, the alliteration feature helps create prose that sings. There’s even an anagram tool and a tool for finding examples of your phrase or word in use in published books. This is great for adding quotes to your articles or books. ProWritingAid is suitable for every kind of writer and writing style. Let the software know what kind of content you want to create and it will tailor its editing suggestions to fit your style. I’ll admit that the Pro Writing Aid interface isn’t perfect. I’d go as far as saying that it’s bland. But it is intuitive. Simple but not exciting. Writers thrive on distraction-free workspaces so let's count this as a benefit. Anything that takes away from the act of writing is an annoying distraction. Maybe the developers made it simple-looking to keep us focused on the most important stuff. 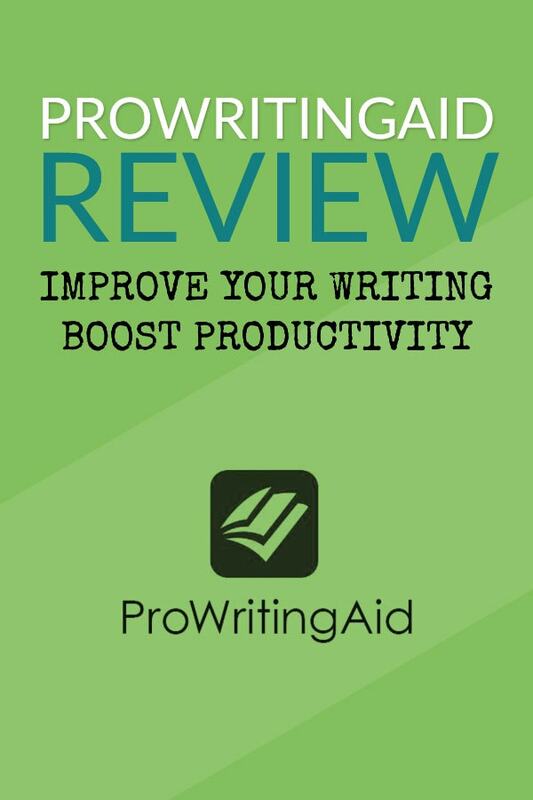 Despite the basic appearance, ProWritingAid will 10x your productivity (to borrow an oft-used Silicon Valley phrase). At $60 a year, Pro Writing Aid is superb value. The suite of tools is a powerful companion for your writing. 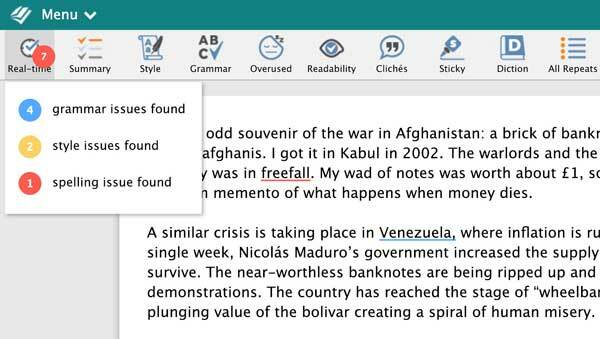 Like an editor, proof reader, plagiarism detector, spell checker, thesaurus, and style guide all built into one app. Each one of these tools is worth the entry fee. The lifetime version of ProWritingAid Premium costs $210. A complete steal. Premium plus costs another $10 a year but gets you 50 plagiarism checks a year. Grab the lifetime deal of Premium Plus which costs at $320. That gets you 50 plagiarism checks per year. Students get 20% off and if you want to buy multiple licences, a sliding scale of discounts will save you some money. Download and run a small executable file and a button will appear on Word. This button gives you access to ProWritingAid’s reports. Unfortunately, Mac owners can’t use the app with their desktop version of Word. Fortunately, There’s a plugin for Google Docs. The Google Docs free add-on gets two stars by reviewers of the plugin. That’s two out of five. And I have to agree with the people that voted. It’s not a great addition to your Google Docs workflow. It’s clunky and hard to work with. I don’t use it. I’m not a fan of the Chrome plugin. For spelling checks on emails, forms, and quick correspondence in your web browser, Grammarly offers a better plugin. I’m a huge fan of Scrivener and I use it app for 90% of my writing. ProWritingAid is unbeatable for editing something fast. But for long form work, books, and in-depth blog posts (like this one), Scrivener is my go to tool. But luckily, both apps work together. In fact, there are many benefits to using both. The writing community loves both Scrivener and ProWritingAid, so the developers of both apps came up with a solution to marry both together in a harmonious and (hopefully) everlasting relationship. Note: you need the Premium version of ProWritingAid to run the desktop app. Download the ProWritingAid desktop app to make the power of ProWritingAid’s features work with your Scrivener documents. Open your Scrivener documents in the desktop app and run your usual checks and reports. Once you’ve finished, hit save and the document will automatically save in Scrivener without affecting the format. The online editing tool is nicer to work with than the desktop app (which is aimed at Scrivener users). You’re also sure of having the latest updates and security patches. A neat feature is the ability to choose your writing style for the piece you’re working on. The software will then alter the editing suggestions to suit your topic. 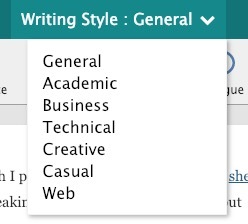 Choose “casual” or “web” for general web writing. If you produce academic papers or write for business websites, the “business” or “academic” writing style options are the ones to choose. After choosing a writing style, click the report again to see how the software interprets the text based on the new chosen style. Choose a version or dialect of English using the Language drop-down menu. 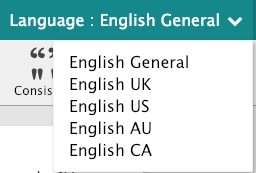 Choose between British, American, Australian, Canadian, and general English. Handy for when you’re writing for different markets or audiences. The plagiarism report works like Copyscape’s main feature or Grammarly’s plagiarism tool. Click the report. Note: it’s the last report in the list – click the More icon with the orange plus in the reports bar. The plagiarism check takes a little while to run its checks. The results are superior to those of Copyscape and similar to those of Grammarly. ProWritingAid returns the percentile of non-original text in your document and highlights the offending sections of text. If you hover over or click on the sections of text, you can see which articles also contain the same content. Unique content is important for ranking on Google. It’s also essential for avoiding litigation. Note that plagiarism checks come with an extra cost unless you have Premium Plus (which gives you 50 checks a year). You can also run the check through a Microsoft Word Add-In. I never use this as I’m a huge fan of Scrivener for writing and I barely touch Word these days. Hemmingway Editor – A simple free tool favoured by many bloggers and indie writers. The Hemmingway app is not as powerful as ProWritingAid and can be aggressive with the suggestions. Grammarly – One of the best-known grammar and spelling editor on the market. It’s a slick-looking product with great features. How does PWA compare to Grammarly? Grammarly is a one-size-fits-all type of tool. ProWritingAid lets you choose styles and languages on the fly. From a pricing point of view, ProWritingAid is the winner, offering a $60 a year subscription and a 2-year subscription for $90. An even better offer is the lifetime deal for $210. Never pay for the app again and get all the premium features. Grammarly has never offered a deal this good. Despite the app being free for use as a browser plugin and a desktop app, the Premium plan costs $139 a year. That’s twice as much as ProWritingAid. And there’s no lifetime deal available. If you’re on a budget, ProWritingAid is a better choice. Budget aside, ProWritingAid’s features and tools beat Grammarly’s feature-set hands down. Grammarly is better as a spelling checker for direct use on the internet (think email, forms, etc) and the desktop app is beautiful to use. But if you’re a serious writer, pro blogger, or content creator, it doesn’t hold water compared to ProWritingAid. ProWritingAid offers a lot of reports you can use to solve writing problems and technical roadblocks. 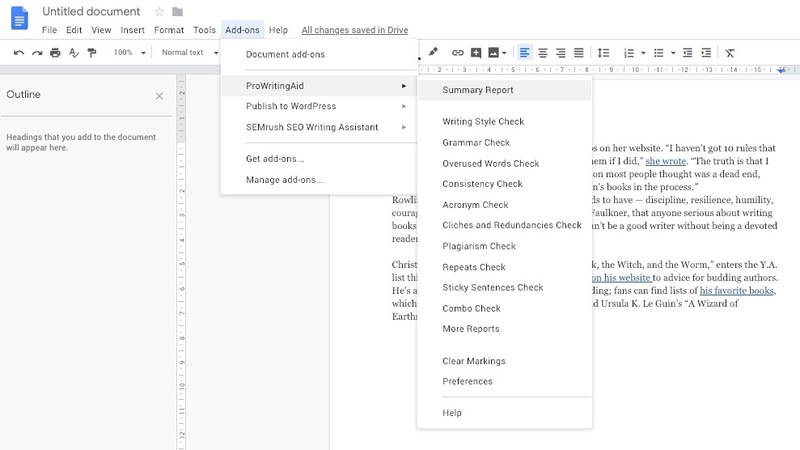 The first report you’ll see across the top of your screen is the “Summary”, which gives an overview or a bird’s-eye view of your writing piece. A summary report links to other relevant reports so you can go deeper on the parts that interest you. Score numbers at the top of the page, while useful, offer few major insights. Use them to keep tally on your progress. This is also the place to come for a word count and find out (for nerdy reasons) where you compare to other ProWritingAid users. The app tells you how dynamic your vocabulary compares to other users of the software. This is one of the most important reports. Find out if you’re overusing passive verbs (“is based”, “were selected”, “been tried”, “is seen”, etc), adverbs, and repeated sentences. Stephen King, the hyper-successful (adverb intended) horror writer, wrote in his excellent book On Writing, “I believe the road to hell is paved with adverbs”. Mr King might know how to write, but that’s just one opinion. There are no fixed rules you must obey here. However, most people over use adverbs and it’s worth taking some time to find alternative words. Unless you’re the greatest (or the most boring) writer in the world, the Grammar Report will find issues worth investigating. Some will be obvious errors. Others you can ignore. Your style, the technical terms you use, and the structures that define your voice, might appear as grammar issues. It’s your choice to change or leave. This report also highlights spelling issues. As with all suggestions in ProWritingAid, you can ignore them and continue working by clicking the “eye” icon beside each issue. Jump directly to the issue by clicking the curved arrow icon. And click the “tick” to accept the suggestion. This report dives deeper into the style of the piece and locates overused occurrences of words and phrases. If you use a particular word too often, making your writing boring, glance at this report before you publish and adjust as you see fit. The Readability report displays a measure of difficulty of reading for your text. When writing for the web, it can help to keep your writing clear and understandable if you imagine your audience to be an 11-year-old. If an 11-year-old student in the US can read your article without problems, you score highly. I don’t put too much currency in this report but I use it to baseline the top ranking articles on a topic on Google. For example, if the top 10 ranking articles on the first page of Google are all considered super easy to read, it wouldn’t make sense to compete by writing a dense academic-style article. If you like to create writing that flows (and who doesn’t?) the Sticky Report is the place to check how often you use words like “in, on, just, with, some, and the”. These are called glue words. Why is is so bad to (over)use these words? The more filler words you use, the slower a reader moves through your writing. And this hinders the velocity of idea transfer. Crafting short, concise sentences should be a goal of every writer. Long, dawdling prose can be tiring to read. After all, the purpose of writing is communication. And the more static in your writing, the harder readers have to work to pick up a signal among the noise. Use the Sticky report to find and eliminate filler words. When writing in different styles, you might want to produce content that matches other published texts in your target style (Web, General, Academic, Business, Technical, Creative, Casual). The structure report shows how your writing style compares to other writers. This is a technical report that won’t be suitable for everyone. Suggestions such as “11% of sentences start with a subordinate conjunction”, leave me cold. This report can help you be creative with your vocabulary. Helpful for people that fall back on certain words for every idea. 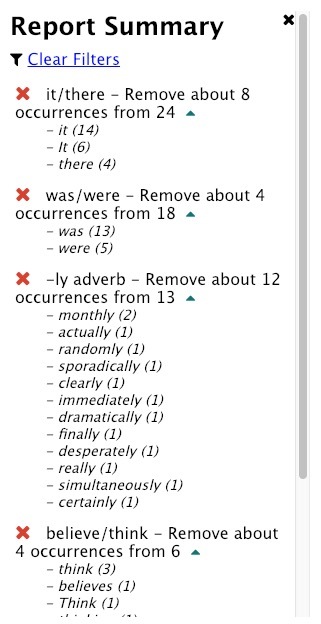 The report sidebar lists all the nouns, verbs, adverbs, and adjectives that have possible replacements. It’s a report that will take time to process, but your writing will be more colourful and less predictable thanks to the thesaurus suggestions. This report includes recommendations for reducing the “vague” and “abstract” words in your writing. I’ve never found it particularly useful. Suggestions such as “avoid this phrase” without offering any context provide little help for improvements. Important for academic and technical writers, and for the very precise writers out there. The most useful feature is when the report highlights an acronym, such as UCLA, that hasn’t been introduced in the text by its full title. The other reports are more niche-focused and specialised. For certain types of writing, the suggestions might help improve the flow. 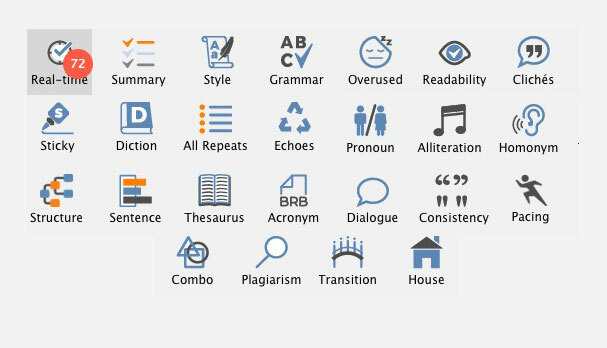 New York Times literary writers probably use these features. But the time spent processing the information in these reports has diminishing returns. Clichés – Finds those over-used phrases we all fall back on. All Repeats – Lists all repeated text. Sentence – Checks the length of sentences and creates a graph of the number of occurrences. Dialogue – Add/remove dialogue tags and find out what percentage of your text is composed of dialogue. Consistency – When writing casual or web styles, nobody will complain too much about inconsistencies in hyphenation or UK/US spelling, but for more technical writing, this can be helpful. Pronoun – Helps you find the “he did, she said, he said” phrases in your text. Alliteration – Finds alliteration in the text. Most of the time, this won’t be a problem. Alliteration can make your writing shine. Poets and creative writers might want to increase the instances of alliteration in their text. This report keeps you on track. Homonym – Finds the places where you wrote “there” instead of “their”, for example. Transition – ProWritingAid highlights the places where a phrase connects one idea to another. Bill Bryson, in my humble opinion, is the master of the transition. Transitions help keep the writing flowing. House – Lets you customise your own rules for writing. This is for advanced users only and is technical to set up. Combo – Combines your favourite reports into one. Plagiarism – Highlights where the writing blatantly or inadvertently copies another price of writing. Great for writers in all industries, styles, and genres. The free version is a solid product. Finely tune any piece of writing with over 20 reports. 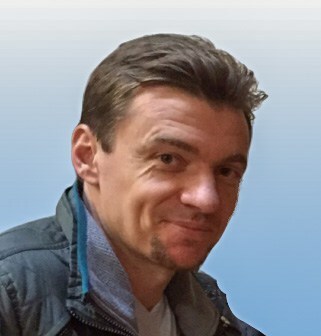 The undo function in the online software is screwy. I have lost work through over-enthusiastic undoing. The browser extension isn’t a worthwhile addition if you already use Grammarly. The Scrivener integration could be more “integrated”. Nobody wants to switch to another program to edit.